No reviews of this episode? I enjoyed this one, one of my favourite scenes of any Minder episode, was when the Police were about to raid the lock up and Arthur hides the jewellery in the filing cabinet. I just loved that scene. Arthur retire, never. Ray might be up to speed with modern business practises, but he has a long way to go to learn the guile of his uncle Arthur. A good episode this, some great dialogue, good characters, good to see Liz Fraser in this episode, and some top filming locations, just runs along nicely. I have to admit I do like seeing Rays dad in the series, I find him a good character who brightens up most episodes. Some good points there daz. I like Gerry 'Bechers' Brook in this one, it was nice to see that even in later Minder episodes there were still a lot of nasty types looking to fit people up. I think Bechers is definitely a candidate for someone who should have made a second appearance in the show. This episode always seems like it could have been a precursor/pilot to a little Ray Daley spin-off and/or what Minder might have been like had Gary Webster contemplated going it alone without GC. Both Alf and Monty are interesting in this too, more folks in Arthur's world who are both 'dodgy pretending to be straight' types that often appear in Minder. Two things I love in this one - Ray computerising the lock up on an 80x25 character MS-DOS based database program and an early Ryan Aur sticker at the travel agents. The only thing really bad about it eas the inconsistency regarding Arthur having kids. Always very enjoyable to watch this one. In this one, Ray looks like he has used Borland Paradox or some sort of dBase version. Was just watching this episode online for the umpteenth time. It is an enjoyable one. 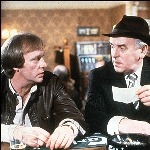 However I do think that there should have been more returning characters in Minder. Some of the episodes 'stand alone' a little too much I feel, characters are often introduced when everyone knows them except the audience! This one contains 'Hapless' Harry, whose reputation among the regulars is clear and yet we never hear of him before or after. Obviously at the time people tuning in for the first time could enjoy viewing without needing to know much background, however when I know every episode it is a bit jarring when characters are sledge hammered into a storyline. The only thing really bad about it eas the inconsistency regarding Arthur having kids. Is this the episode where someone says Arthur hasn't got anyone to succeed him in his business? I took that as possibly meaning that his kids were "straight" i.e. having grown up with the trappings of bourgeois respectability they weren't really suited or inclined towards a life of duck and diving. Maybe I'm reading too much into it and/or being unduly kind to the scriptwriters. I like the bit with Alf at the start (the cafe owner) where he is moaning about Arthur's dodgy blender pureeing the mashed potatoes. Arthur says that the fashionable way to eat mash - and he is right as lots of people puree their mash on cookery shows. I think this is a great episode. And I can imagine Ray taking on Arthur's business. It would have been a great spin off show with Ray in charge; but sadly I don't think many people would have been interested. Fifty minutes of pure entertainment! Lots of wonderful moments and lines. Arthur and his magical filling cabinet is a series highlight. I particularly liked Arthur's line about the basic rules of English fair play, "Get your retaliation in first!" A few nice gags keep this one ticking over.Gerry Brooks known as Beechers because he's a terrible fence. One of the best Ray episodes in my opinion, love the way hapless really niggles Arthur with his bragging, and as already mentioned the filing cabinet scene is pure Daley gold! Unlike most others it seems, I didn’t find this one a standout episode. Some decent lines and and interesting premise in Arthur retiring, but I just didn’t find it that gripping compared to some. Great that Arthur helped Ray out and stitched up Beechers, but the ending was very abrupt I thought. I think that's fair, this one is almost a pilot episode for Ray going it alone - while watching it though - certainly for me you just know Arthur will be back at some point in the story. Nevertheless, 'Bechers' (I have no idea why he's scripted with only a single 'e' in his nickname) is a very decent indecent character and certainly one to add to the 'why didn't he get used again' list. Just showed that Ray needed Arthur and Arthur needed to be in the game.